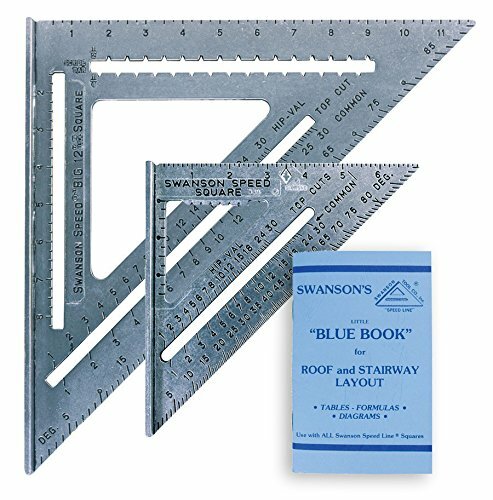 The Swanson Tools Speed Square is an American, triangular-shaped, carpenters' layout out tool which combines some of the most common functions of a try square and framing square into one. It is used to make basic measurements and mark lines on dimensional lumber and may be used as a saw guide for making short 45 and 90 degree cuts. The Speed Square is 5 tools in 1. Try Square, Miter Square, Saw Guide, Line Scriber and Protractor. This kit comes with the S0101 7-inch and the T0108 Big 12-inch Speed Square. Includes 44-page Swanson Blue Book. Made in the USA. View More In Carpentry Squares. If you have any questions about this product by Swanson, contact us by completing and submitting the form below. If you are looking for a specif part number, please include it with your message. Blem Cosmetic Second PEC USA 12" 4R combination machinist square acc .001"/6"
Made in USA PEC 6" premium engineer / machinist square accurate to .0006"/6"
INSIZE 4707-75 Machinist Square with Wide Base, 3.0" x 2.0"
INSIZE 4747-150 45 Degree Square with Wide Base, 5.9" x 3.9"